About a month ago I planted a few calla lily plants but now they're falling over. The leaves all look green and healthy. What is causing this? Are they not planted deep enough? 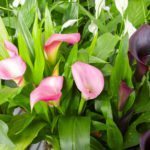 I'm a newbie at calla lily so any and all help will be greatly appreciated. Here is a link that will help you pinpoint the cause.